This past month we have made many important Advanced Accounting enhancements including to two utility options. 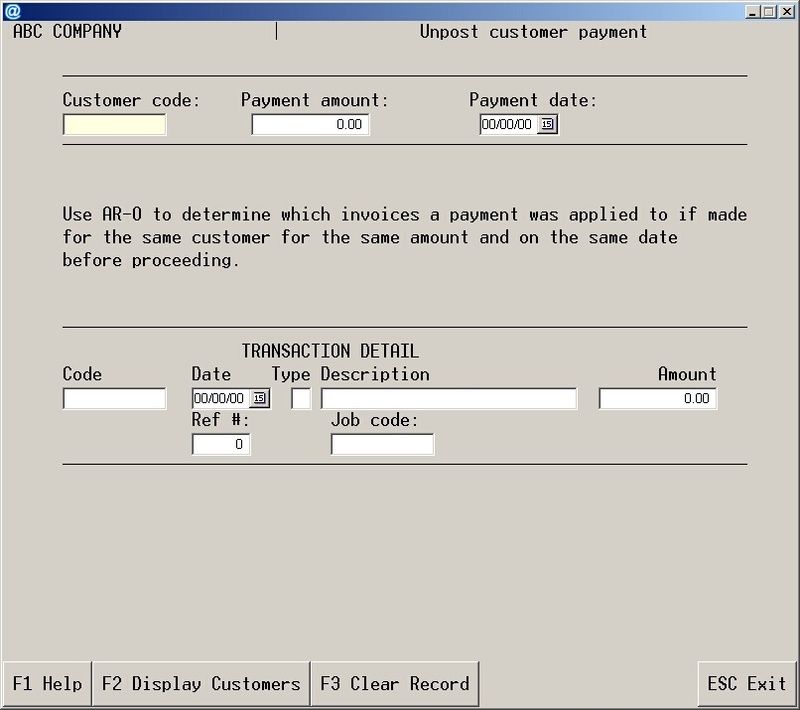 Accessed via the Addsum utilities (via UT-G and in the Accounts receivable section) from the Advanced Accounting 7i menu, the unpost AR payment (aka "Unpost customer payment") utility allows an end user to reverse an accounts receivable customer payment where that payment might have been applied to the wrong customer or was for the wrong amount or was applied to the wrong invoices, etc. While it does remove the payment record from customer transaction and related files, it nonetheless leaves an audit trail in the general ledger. Payments not fully applied can also be unposted. For various technical reasons, something that was not previously allowed by the utility was the ability to unpost a payment for the same amount on the same date for the same customer. Yet, the entry of a duplicate (or even triplicate) payment for the same customer on the same date and for the same amount is one of the reasons why a payment may sometimes in fact need to be unposted. This ability now exists. The program as enhanced however does require user interaction to determine which invoices the duplicate payment was applied to when it involves the same date and amount. So users should first determine what those invoices were before attempting to unpost such payments. There are at least two ways to do this, the best one being the AR-O credit analysis/customer payment history report which is referenced in the utility option itself. 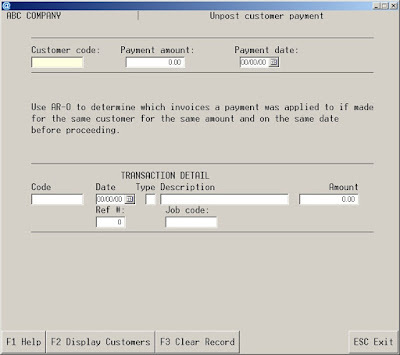 Whether an errant duplicate payment was applied to one or twenty or more invoices doesn't matter: the user will be asked to confirm which invoices were involved and ensure that they add up to the duplicate payment amount to be unposted, followed by the normal confirmation screen. The payment could even have been made in triplicate or quadruplicate on the same date for the same amount for the same customer but can still now be unposted as long as the program is first told which one of those to unpost, and then second, which invoices were errantly applied in connection with that payment. This updated option will be standard with the Adv 8 add-on and will include support in that release for the expanded invoice numbers and the new GL audit file. A version compatible with Adv 7i will also in the interim be available for users who have these utilities and that may have need of this capability. 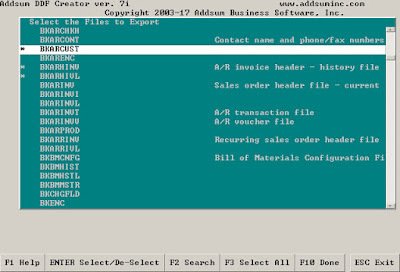 The Addsum utilities collection is an add-on option for Advanced Accounting. This option has been dramatically changed compared to the older DDF option as released by Business Tools prior to 1997. This version which allows you to select only desired files for outside access and it also remembers your prior selections, and has also been extensively modernized to comply with newer Pervasive requirements. It first started to become available in 2003-2004 with significant enhancements that followed in 2007, 2008 and 2010. The latest enhancements involve an improved interface, updates for pathing defaults, and an improved searching capability when attempting to find data files ("tables") to be included in the DDF's. This updated version is now standard for Adv 7i and will become the new standard add-on option for Adv 8. 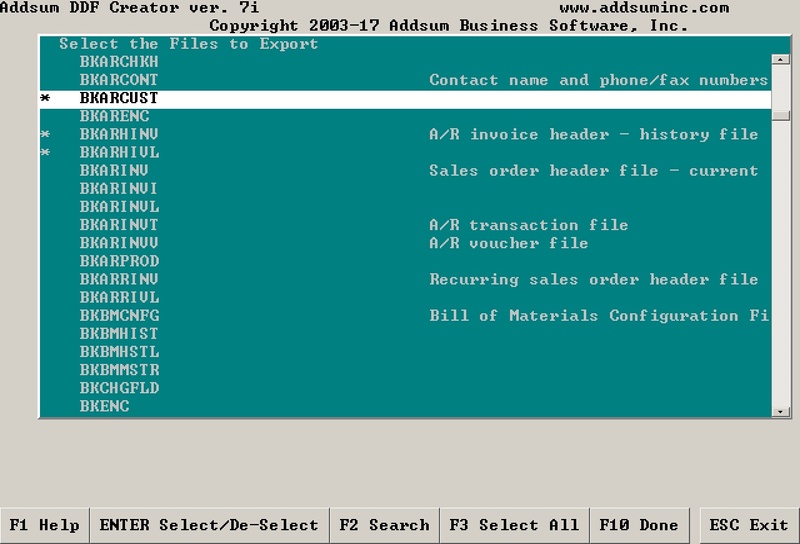 The DDF creator is an add-on option for Advanced Accounting and when installed is available from the accounting software menu under UT-P ("Create DDF files").